Metal cut to length lines are used for processing coiled metals into precise length pieces for resale or further processing. 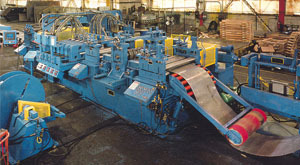 Cut-to-length lines typically incorporate a number of machines to provide value added services while processing coil to piece. Light gauge cut-to-length lines are typically for processing material thicknesses up to 0.0625″ (1.6 mm) while heavy gauge cut-to-length lines can be used for processing material up to 1″ (25.4 mm) thick or greater. Metal cut to length lines typically have relatively tight tolerances on overall piece cut lengths. As with most metals processing, the industry standards that govern these tolerances are ASTM, ANSI (American National Standards Institute), AISI (American Iron and Steel Institute), EN (European Standards) , JIS (Japanese Industrial Standards Committee), or API (American Petroleum Institute). 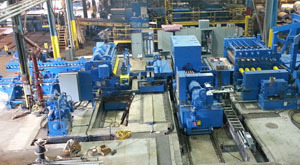 Element Machinery has supplied cut-to-length lines handling thicknesses from 0.015″ (0.4 mm) to 1″ (25.4 mm) and strip widths from 24″ (635 mm) to 120″ (3048mm). 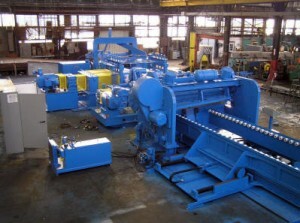 Looping cut-to-length lines are designed so that the material is accumulated in a loop while the shear performs a cut to allow for cutting material without stopping the feed. 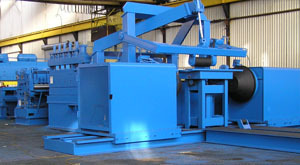 Flying shear cut-to-length lines allow for the shear to accelerate and synchronize to strip speed to cut material without stopping material feed. Heavy gauge cut-to-length lines are designed for material thicknesses larger than 1/2′′ (12.7 mm). By alternating between corrective leveling and plate flatteners, a wide range of input thicknesses can be accommodated.